Coleus forskohlii is an herb grown in Nepal, Thailand and India. A member of the mint family, it has traditionally been used in Asian medicine for skin, lung and heart conditions. Forskolin is a substance of Coleus forskohlii that has been considered the most useful part of the herb, although the whole plant may prove to be effective for treating many conditions. Many more studies are needed to identify the dosage, treatment and safety of Coleus forskohlii. Consult your physician before beginning any herbal treatment. 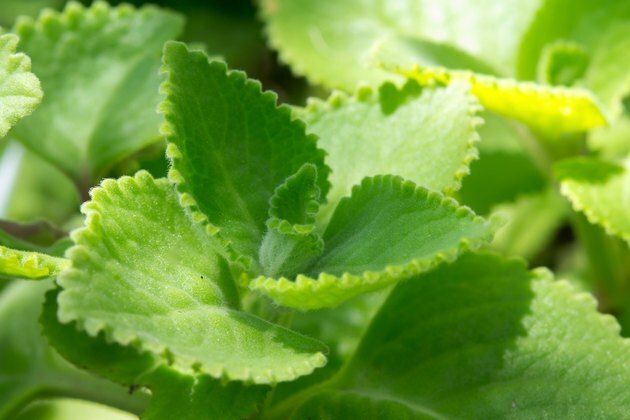 Two controlled trials, according to NYU Langone Medical Center, have found forskolin to be potentially beneficial for the treatment of asthma. The studies showed that forskolin works as a stabilizer for cells that release histamine. It also relaxed smooth muscle tissue. Coleus forskohlii also may aid weight loss. A concentrated forskolin extract has been shown to burn fat. Forskolin also helped obese men manage their weight in small clinical trials, reports Memorial Sloan-Kettering Cancer Society. A small study of 23 females, published in the December 2005 issue of the “Journal of the International Society of Sports Nutrition,” reported that Coleus forskohlii did not help with weight loss but did slow or prevent weight gain in mildly overweight women. Eyedrops made of a concentrated forskolin may help with the treatment of glaucoma, according to NYU Langone Medical Center. In the cases where glaucoma caused increased intraocular pressure, forskolin successfully lowered the pressure. More studies are needed to know the efficacy of the herb on glaucoma treatment. Integrative Practitioner grades Coleus forskohlii with a "B" for effectiveness in glaucoma treatment. Studies are needed to understand how Coleus forskohlii works and to what extent it will help with various issues. Tentatively, the herb may also benefit those suffering from allergies, congestive heart failure, cancer and hypertension. Tufts Medical Center suggests that Coleus forskohlii may also be useful in treating irritable bowel syndrome, menstrual cramps, psoriasis and bladder pain.